In the Cell Membrane unit you will learn about cell size and the structure and function of cell membranes. Cell membranes protect and organize cells. All cells have an outer plasma membrane that regulates not only what enters the cell, but also how much of any given substance comes in. 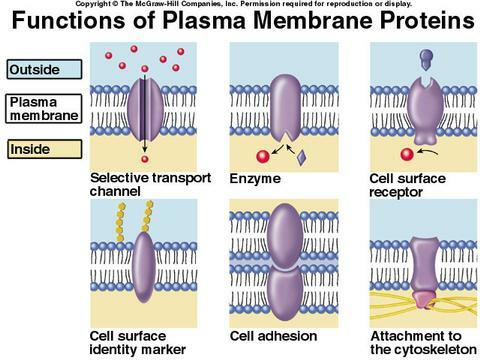 Like all other cellular membranes, the plasma membrane consists of both lipids and proteins. The fundamental structure of the membrane is the phospholipid bilayer, which forms a stable barrier between the compartments inside and outside of the cell. Proteins embedded within the phospholipid bilayer carry out the specific functions of the plasma membrane, including selective transport of molecules and cell-cell recognition. Describe why the understanding of cell membrane structure has changed over time. Explain why phospholipids form bilayers in water, with reference to hydrophilic phosphate heads and two hydrophobic hydrocarbon tails. Contrast the two types of transport proteins: pumps and channels. Proteins embedded in the membrane, which bind to specific hormones. When the hormone binds, it causes the receptor protein to undergo a conformational change, which signals the cell to perform a function. Integral proteins that catalyze specific chemical reactions. Many of these enzymes catalyze metabolic reactions or are a part of a metabolic pathway, such as ATP Synthase in aerobic respiration. Proteins that form tight bonds between adjacent cells in tissues and organs. Receptors for neurotransmitters at synapses between two nerve cells. Glycoproteins on the surface can also be used for cell identification purposes. Integral proteins that span the membrane and provide a passageway for molecules to move from an area of high concentration to low concentration. Specific proteins are also used for facilitated diffusion. Proteins that use ATP to move substances from a low concentration to a high concentration across the membrane. Describe the structural placement of cholesterol within the cell membrane. Most of the cholesterol molecule is hydrophobic and therefore embeds within the tails of the bilayer. A small portion (hydroxyl –OH group) is hydrophilic and is attracted to the phospholipid head. Cholesterol embedded in the membrane will reduce the fluidity making the membrane more stable by the hydrophilic interactions with the phospholipid heads. Cholesterol adds firmness and integrity to the plasma membrane and prevents it from becoming overly fluid, it also helps maintain its fluidity by disrupting the regular packing of the hydrocarbon tails. At the high concentrations it is found in our cell's plasma membranes (close to 50 percent, molecule for molecule) cholesterol helps separate the phospholipids so that the fatty acid chains can't come together and crystallize. Therefore, cholesterol helps prevent extremes-- whether too fluid, or too firm-- in the consistency of the cell membrane. 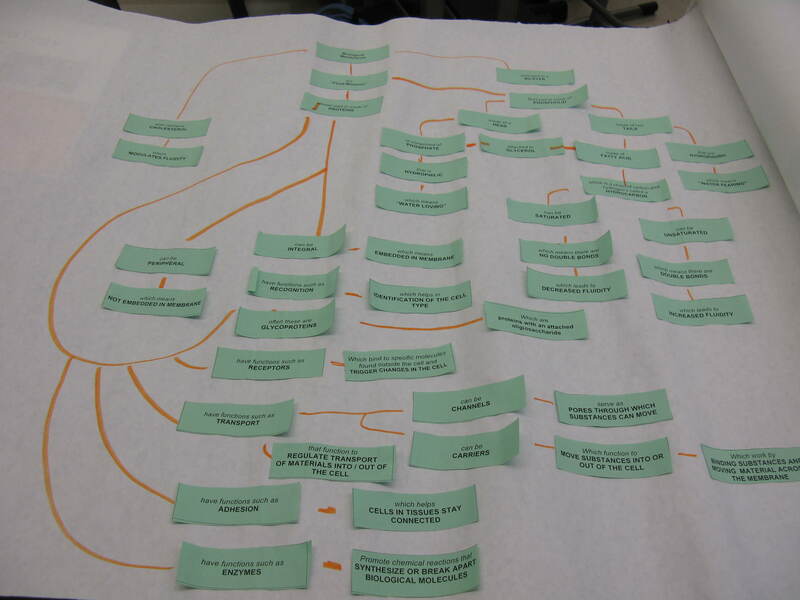 ​1.3.S.1 Drawing of the fluid mosaic model (Oxford Biology Course Companion page 31). integral (transmembrane) and peripheral proteins. Integral proteins are embedded in the phospholipid of the membrane, whereas peripheral proteins are attached to its surface. 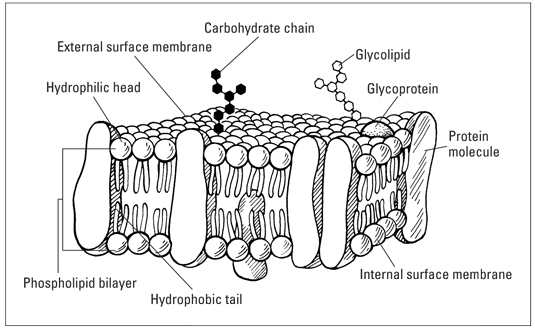 Glycoproteins are carbohydrates attached to surface proteins. Membranes are not identical. The differ in thickness and the ratio of proteins:lipids. Other than predicted by the model, the membrane proteins do not have a very good solubility in water - in fact they have hydrophilic and hydrophobic regions. The hydrophobic side is anchored inside the membrane. When the membrane proteins would cover the lipid bilayer, their hydrophobic regions would be in contact with water, which destabilizes this construct. Even if they would be oriented towards the membrane, they would face towards the hydrophilic heads of the phospholipids causing the same effect. Additionally the proteins would also separate the hydrophilic phospholipid heads from the water. So there is no real stable solution in embedding the membrane with proteins. Describe conclusions about cell membrane structure drawn from improvements in techniques for determining the structure of membrane proteins.. 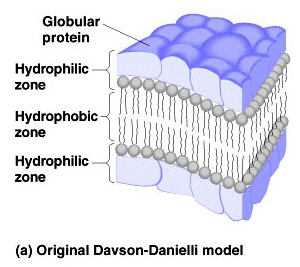 Compare the Davson-Danielli model of membrane structure with the Singer-Nicolson model. For lots more animations on cell structure and function and cell transport, visit North Harris College. Membranes lessons from HippoCampus Biology. ​Cell membranes are structures of contradictions. These oily films are hundreds of times thinner than a strand of spider silk, yet strong enough to protect the delicate contents of life: the cell’s watery cytoplasm, genetic material, organelles, and all the molecules it needs to survive. ​Hank describes how cells regulate their contents and communicate with one another via mechanisms within the cell membrane. ​The Davson-Danielli model is an idea proposed on how cells regulate their environment. The proteins are on the outside of the bi-layer membrane. However, membranes need to allow for solute particles to pass back and forth. When proteins are on the outside, it blocks the solutes from passing through, preventing homeostasis. Therefore, we have to reject this model. In the Singer-Nicholson Fluid Mosaic Model, the integral proteins are embedded in the bi-layer. They have the ability to open up and let particles move back and forth.